Melt vegan butter in a pot. 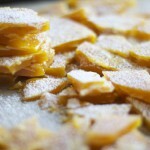 Add saffron and vanilla sugar and whisk together until evenly blended with the melted butter. Add non-dairy cream and stir. Add sugar and syrup, stir and place the pot on the heat again. Bring to boil then reduce the heat while continuing to stir. Allow to cook on low heat for 10-15 minutes while stirring. Test the mixture by adding a dollop to a glass with cold water. If the sugar batter solidifies stands up in the cold water, the brittle is ready. Remove the pot from the heat. Add almond flakes and stir. Pour the sugar batter on to a large tray covered with a sheet of baking paper. Let cool down and solidify. 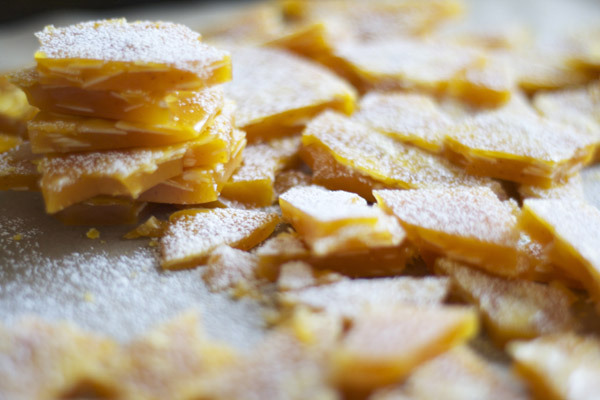 Once solid, smash the brittle to pieces or break it apart. Dust with powdered sugar and store in an airtight container in a dry place.